Offshores. Until the late 80s of the last century, we didn’t even know they existed. 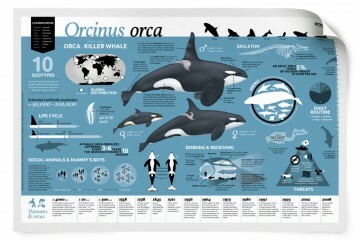 Only more than twenty years later, it has become clear what they eat, and we still know very little about these orcas. The reason for the lack of knowledge is already given in their name. This ecotype lives far from the coast and is therefore difficult to find and study. Offshores do show themselves sometimes and they reveal a glimpse of their way of life. These visits are rare and always unexpected. Dave Anderson sets off on his catamaran out to sea for a whale-watch trip. They have just left the port of Dana Point, California. At this time of the year the migration of gray whales is in full swing and Dave knows his customers will not be disappointed today. 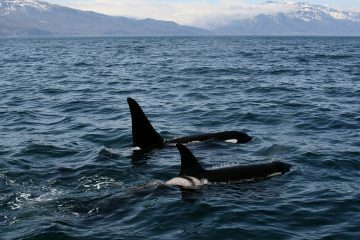 But his expectations are exceeded as, not far from the coast, a group of more than 40 orcas comes into view. The curious animals swim along with the boat, watching the excited spectators. Dave doesn’t recognize the animals quickly sends some pictures to Alisa Schulman-Janiger, a killer whale biologist from California. She sees immediately that these are not transients but offshore orcas. For Dave and his guests this day couldn’t have been more of a success. The existence of residents and transients has been known since the 70s of the last century. The two ecotypes are genetically distinct and they show an entirely diverse way of life. Nobody expected the existence of a third ecotype. The discovery of offshores begins in 1988 with a few snapshots of an ecotour organization close to the islands of HaidaGwaii. This archipelago, formerly known as the Queen Charlotte Islands, is located 70-100 km from the mainland, on the edge of the continental shelf. 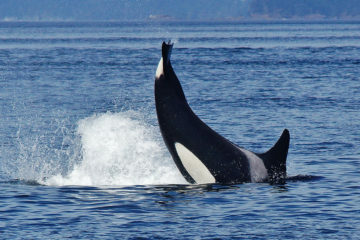 The dorsal fins of the photographed orcas were not recognized by the researchers, and because the animals lived in large groups, it was assumed that these orcas belonged to unidentified pods from another resident community. The situation has changed since 1991, when more encounters with offshores followed. Biologists, including John Ford, Graeme Ellis and Linda Nichols, discovered that these shy and unpredictable orcas couldn’t be residents or transients. Firstly, there is a subtle dissimilarity in appearance. 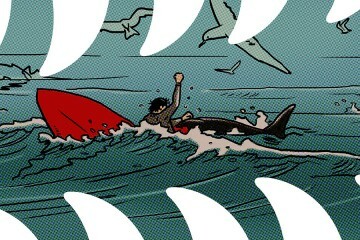 The dorsal fins are more rounded and these often show more scratches and nicks. The animals are also slightly smaller than the other types – an adult male is about the same size as a youngster in a residential community. 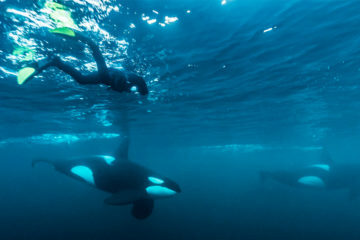 The second striking dissimilarity was discovered by researchers, when they were listening to discussions of these ‘new’ orcas, using a hydrophone. “The calls they produce are amazing,” says Ford, who is an expert in the field of orca dialects. “They are chatterers like residents, but their sounds are totally different from the sounds of residents and transients that I’ve heard. This suggests that they are not affiliated with the groups that we know.” Because these orcas live far from the mainland, and due to the fact that they were not spotted in coastal waters in 20 years of orca research, has earned them the name of ‘offshores’. However, the orcas seem to challenge this new name. On September 6, 1992, a large group of 75 unknown orcas are spotted in the Juan de Fuca Strait near the city of Victoria. 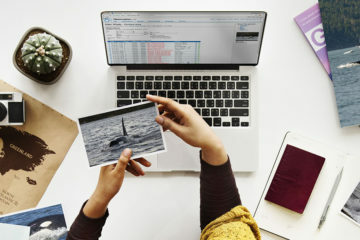 Researchers of the Marine Mammal Research Group and the Research Centre for Whale Research rush to the scene and are able to photograph a total of 67 whales. Two photographs provide a match with animals which were seen around HaidaGwaii. These images confirm that this is a group of offshores, unexpectedly visiting inland waters. During the same period Alisa Schulman-Janiger and Nancy Black spot offshores in Monterey Bay for the first time. In the following years more reports of offshores, daring close to the mainland, come in. And although they are spotted less often than residents and transients, photo-identification led to the discovery of offshores roaming a much larger habitat. Two animals were spotted at Kodiak in Alaska in July. 77 days later and 3267 km away from their previous location, they are seen again in Monterey, California. The longest journey ever documented is from Dutch Harbor, Alaska, to Dana Point, California – a distance of no less than 4435 km. 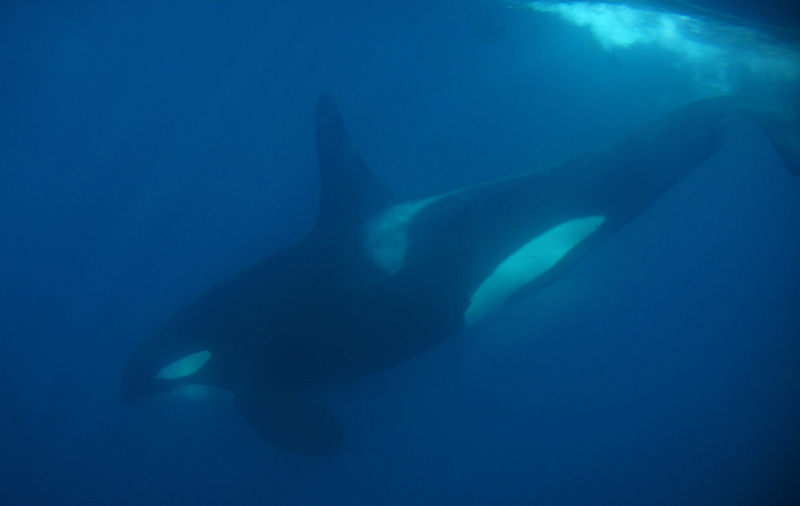 Offshore orcas apparently swim in deeper offshore waters, following seasonality and thereby covering great distances. Once in a while they come close to shore, probably as a result of more food availability in these waters than farther out at sea. The diet of offshores has long been a complete mystery. However, it was soon clear that offshores aren’t meat eaters – they are fish eaters. Like residents, they are living in big, boisterous groups. In search of food they split up into smaller groups, spreading over a larger area. They communicate with one another and hunt for prey by using sounds. This hunting technique is also known from residents, preying on salmon. Other marine mammals like sea lions, gray whales, fin whales and dolphins, are often seen in close proximity to offshores. 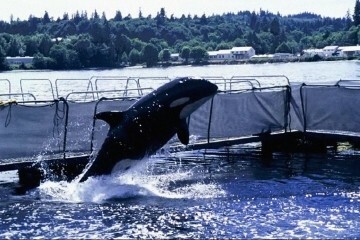 These animals were by no means targeted by the orcas, or behaving like being threatened by them. There is even a report of grampus, also known as Risso’s dolphins, harassing two offshore orcas. In the stomachs of dead offshores remains have been found of different fish species, including salmon, sculpin, kingfish, redfish and some shark species. Various reports confirm this orca diet. For example, Skipper John Mayer and naturalist Sean Swing of Monterey Bay Whale Watch saw a group of offshores chasing a big opah, forcing it to the surface, then tearing it up and eating it. About 80 kilometres off the south-western coast of Vancouver Island Brian Gisborne saw how orcas, probably offshores, attacked and ate blue sharks. 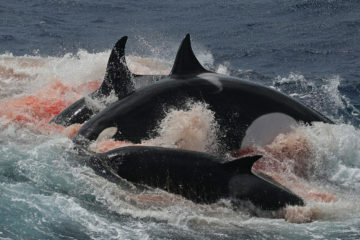 In 2011 a team, including John Ford, observed offshore orcas feasting on sleeper sharks at great depths. Colleague Craig Matkin experienced a similar blowout in Prince William Sound, Alaska. 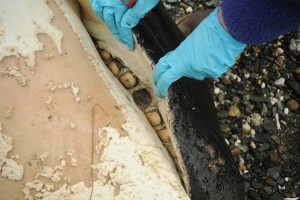 These discoveries solve a mystery, after years of scientific struggle: the teeth of stranded offshore orcas were almost worn to the gums, which doesn’t occur to residents and transients.What causes such extreme dental trauma? It had been speculated, though now it has proven to be true: the preference for shark liver causes the teeth of offshores to deteriorate quickly. The skin of a shark is very rough, like sandpaper. 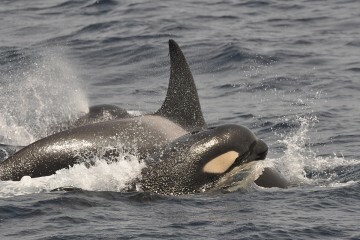 The battered dorsal fins of many offshore orcas might also be the result of fights with sharks. The importance of these sharks to offshores, and the extent to which they have specialized in these prey, are not yet fully understood. However, it is apparent that sharks and big fish form a large portion of their diet. This corresponds with the results of a study by Krahn in 2007. He concluded from analyzing tissue samples that offshores mainly hunt long-lived fish from high up in the food chain. Eating long-lived fish, however, leads to the ingestion of large amounts of pollutants. 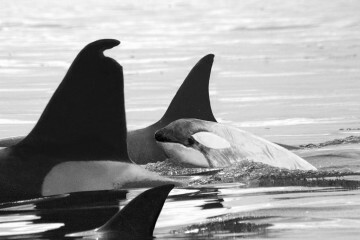 The study by Krahn also showed that high levels of DDT and PCBs are found in adipose tissue of these orcas. In addition, the waters of California, a well-known habitat of the offshores, are quite polluted by agricultural and industrial activities. 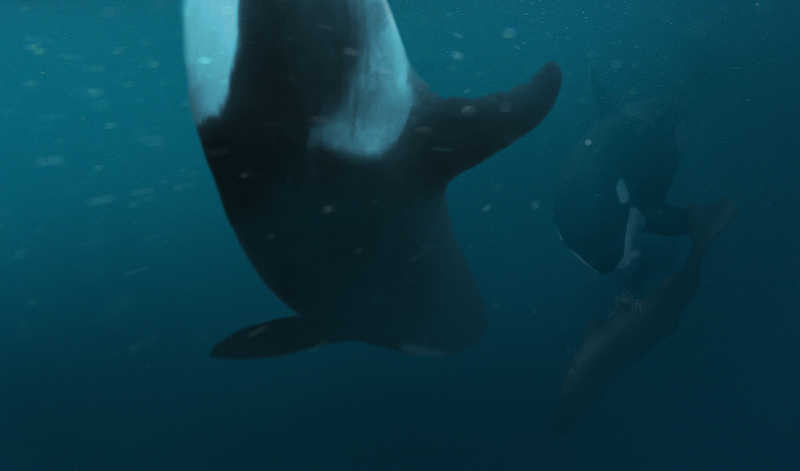 The few encounters with offshore orcas are carefully documented by scientists. 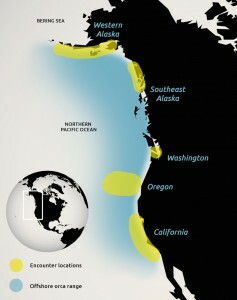 But it is difficult to determine how large the population of offshores actually is. 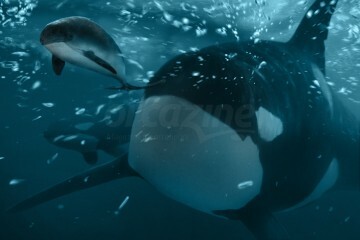 The orcas are easily harmed as a result of their lifestyle, like scarring their dorsal fin and their saddle patch. Individual animals may not be seen for years, and the chances are that they can’t be recognized at the next encounter. Researchers take this probability into account and estimate that there are 350-500 offshores. Unlike transients and residents who live in separate groups within the population area, such as the southern and northern residents, offshores form one population altogether. An interaction between offshores and other ecotypes has not yet been observed, despite the fact that they share the same habitat. Studies of mitochondrial DNA show that offshores are genetically distinct from residents and transients. 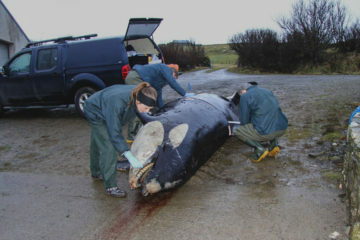 The variations of the DNA, though, are not that different from residents, and some researchers suggest that these orcas once emerged from groups of offshore orcas that have specialized in hunting salmon. It is still unclear whether offshore orcas claim the open ocean as their habitat, or only the continental shelf. Therefore, the term ‘offshore’ only serves to distinguish this population from the other populations. It is certain, though, that offshores are a distinct ecotype or even another species of orca, differing in appearance, language, culture and diet. There is still much to learn about these mysterious freebooters, who prefer to keep a distance from coastal waters. Now and again, out of nowhere, these orcas show something of their rugged beauty and they allow us a very brief glimpse into their extraordinary world. Finding offshores is extremely difficult. The further from the coast, the harder it is. You need a big and safe ship equipped for the open sea. The weather can be quite rough. 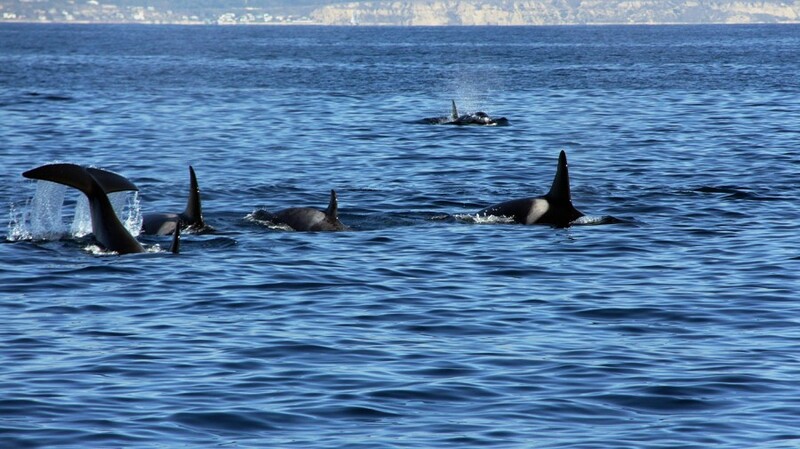 Offshore orcas are as predictable as the weather and the groups are often spread over a large area. 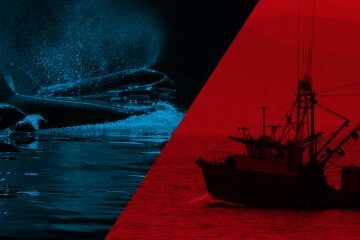 Thanks to high-tech hydrophones it is possible to ‘eavesdrop’ on cetaceans and to find out where the animals are located. Nearly 150 hydrophones are located at the ocean floor of offshore waters in southern California. They are used by the Navy as part of the anti-submarine warfare, though sometimes they are also very useful for detecting cetaceans. For example, the researchers of Cascadia were tipped by the Navy in January 2013, stating that the orcas in the area made unusual noises. 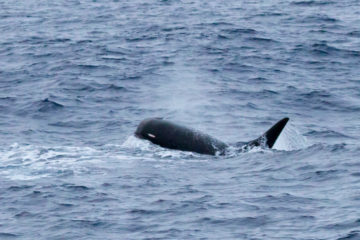 The biologists rushed to the site and discovered a number of offshore orcas gently swimming along with fin whales. 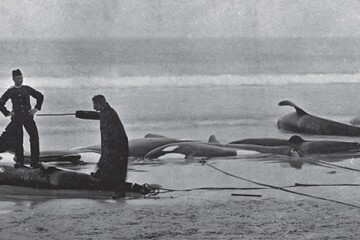 The biologists even managed to provide two animals with satellite transmitters, so that the movements of the orcas could be followed for a while. 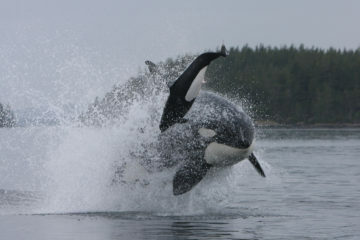 Modern techniques thereby help to unravel the mysteries surrounding offshore orcas and other marine mammals.